The Queensland University of Technology in partnership with the Pasifika Women’s Alliance (PWA), Pacific Island reference Group Inc. (PIRG), Diabetes Queensland and the QUT Pasifika Association (QUTPA) INVITES all Maori & Pacific Islanders to the Pasifika Diabetes Health Forum 2016. This is a FREE event to raise awareness and promote prevention & self-management of type 2 diabetes in Pacific Island communities in South East Queensland . 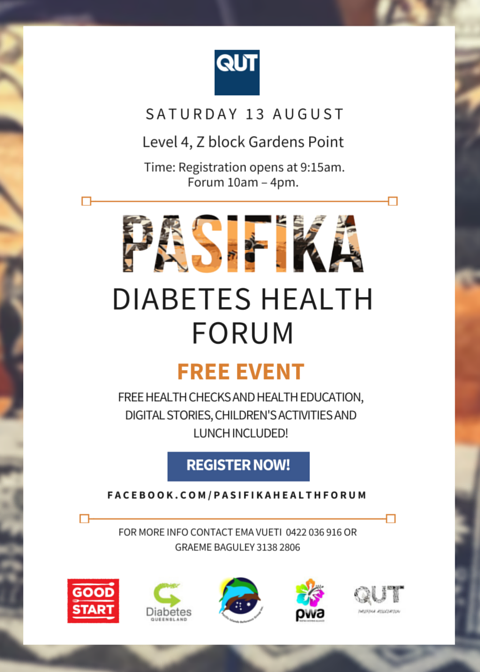 The forum will include diabetes education session, launching digital stories of peoples experiences with diabetes, free health checks and screening, healthy lunch, educational activities for children, talanoa discussion, information stalls and displays on health, well being and diabetes. PLEASE Mark this date in your diary! Open to men, women, families of Pacific Island and Maori communities.